If you'd like to include more meatless dishes in your cooking, this cookbook is for you. 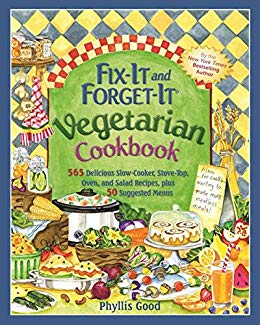 And if you want to cook confidently for your vegetarian friends or family, Fix-It and Forget-It Vegetarian Cookbook is full of tasty ideas. Here are slow-cooker recipes as well as stove-top and oven recipes in one handy cookbook.Half of these 500 recipes are for slow cookers. In fact, all of the recipes are easy to prepare and all are made with easy-to-find ingredients. Here are tried and true vegetarian favorites. And you'll discover lots of fresh ideas using familiar ingredients--food we already buy and love, set to new recipes. Not sure how all the parts of a vegetarian meal come together? Flip to the 50 menus to find well-balanced meals and tasty food combinations. Now you can confidently serve a nutritionally complete vegetarian meal for a weekday family supper, or a feast for a special day. Experience how enticing and satisfying vegetarian cooking can be!Skyhorse Publishing, along with our Good Books and Arcade imprints, is proud to publish a broad range of cookbooks, including books on juicing, grilling, baking, frying, home brewing and winemaking, slow cookers, and cast iron cooking. We’ve been successful with books on gluten-free cooking, vegetarian and vegan cooking, paleo, raw foods, and more. Our list includes French cooking, Swedish cooking, Austrian and German cooking, Cajun cooking, as well as books on jerky, canning and preserving, peanut butter, meatballs, oil and vinegar, bone broth, and more. While not every title we publish becomes a New York Times bestseller or a national bestseller, we are committed to books on subjects that are sometimes overlooked and to authors whose work might not otherwise find a home.